2016-17 CMO Spend Survey: Budgets rise! As budgets increase this year, marketers must rise to the challenge of leading the charge in a data-driven, digitally-led world. Marketing matters and CMOs responsible for these dollars will be measured on how well their initiatives deliver for the business. 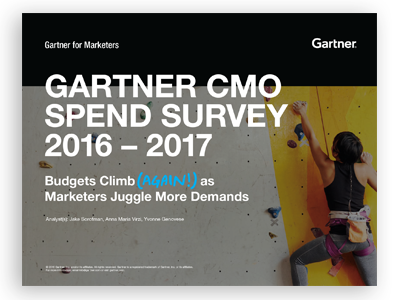 The Gartner 2016-2017 CMO Spend Survey reveals where and how companies are spending marketing dollars. Discover how new spending (at up to 12% of company revenue) is placing novel demands on CMOs to deliver on short-term performance and long-term customer experience. Gartner for Marketers connects you with experts who will advise you in the digital marketing areas that matter most — so you can plan, manage and execute a successful strategy. To speak with a Digital Marketing advisor, contact us at 1.866.592.5144 or gml@gartner.com. © 2017 Gartner, Inc. and/or its affiliates. All rights reserved. Gartner is a registered trademark of Gartner, Inc. or its affiliates. For more information, visit gartner.com/digitalmarketing.